Thank you for choosing Intervention Instruction’s DUI Class Online for your DUI education requirement. IMPORTANT: Please read this ENTIRE PAGE before proceeding with your registration. Evaluation report or verification information faxed to (or scanned and emailed as a single PDF document) and received by Intervention Instruction prior to enrollment. Include a cover sheet with your name and e-mail address. Fax to 773-404-9750 or click here to email. You must fax your Alcohol and Drug Evaluation Report to 773-404-9750 or click here to email. 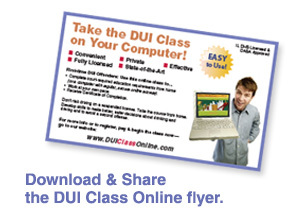 You must supply verification that you have confirmed with your individual court monitor that this DUI Computer Based Course will satisfy the requirements of that state’s court order. Read, sign and submit this form. The class uses course material downloaded from our site after you have paid the course fee and registered for the program. We must also receive all the required case documentation, including the alcohol report. The software you will download integrates with online security features to monitor access, scoring, assignments, etc. You will also receive a Certificate of Completion when you finish and pass the class. The class is divided into 4 sessions with a 48-hour lockout in between each session. You will need to complete the program over a minimum of 8 days and in no more than 30 days. Once you register, you will have 30 days to activate the course (i.e., log-in for the first time). Once you have activated the course, you will have 30 days to complete the program. For questions about any hardware or software issues you are having, please use the email form on our Contact page. IMPORTANT: While we will attempt to notify you via email regarding your progress, it is your responsibility to complete this program within the 30-day time frame. If you fail to complete this program within the required 30 days, you will be terminated from the program and you will be required to pay the extension fee of $150.00 for another 30 days. 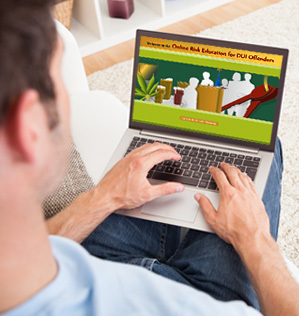 To order the DUI Computer Based Course, click the button below to make your credit card payment and register for the course.